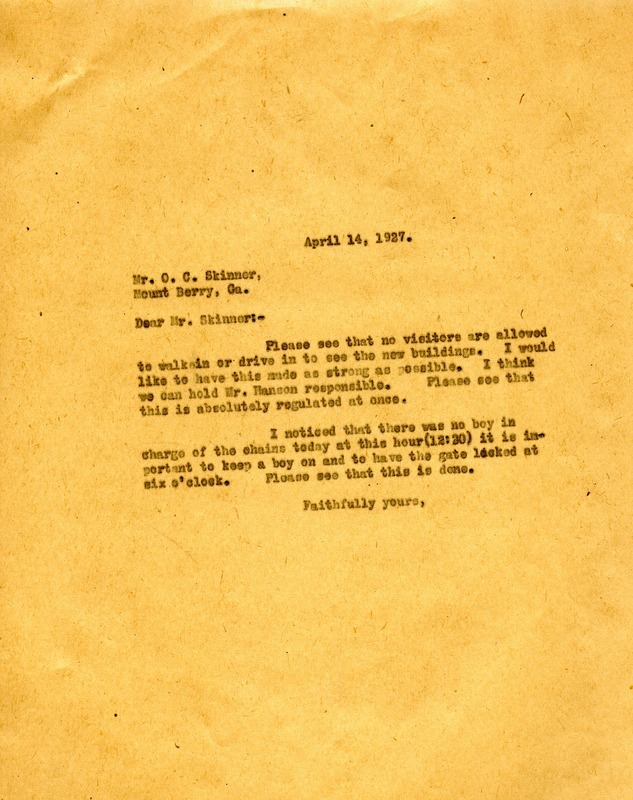 An order to Mr. O. C. Skinner to prohibit visitors from visiting the campus in order to view the new buildings. In addition, there are directives to ensure the gate is locked and watched. Berry believes that Mr. Hanson is responsible for the previous lapse. Martha Berry, “Letter to Mr. O. C. Skinner from Martha Berry.” Martha Berry Digital Archive. Eds. Schlitz, Stephanie A., Christy Snider, Ryan James, et al. Mount Berry: Berry College, 2012. accessed April 24, 2019, https://mbda.berry.edu/items/show/5668.